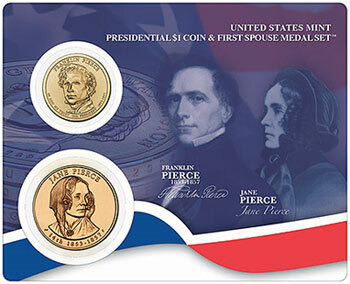 The United States Mint has just released the Presidential $1 Coin and First Spouse Medal Set featuring President Franklin Pierce and his wife Jane Pierce. The sets officially went on sale June 24, 2010 at 12:00 Noon ET. The set includes one Franklin Pierce Presidential Dollar. The obverse of the coin has a portrait of the former President designed by Susan Gamble and sculpted by Charles Vickers. The reverse of the coin features a rendition of the Statue of Liberty designed and sculpted by Don Everhart. Also included in the set is a Jane Pierce Bronze Medal with a design based on the $10 Gold Coin. A portrait of the First Lady appear on the reverse with a scene of her watching debates in the visitor’s gallery of the U.S. Capitol Building on the reverse. Both sides were designed by Donna Weaver. The obverse was sculpted by Don Everhart and the reverse was sculpted by Charles Vickers. The $1 coin and medal are mounted on a durable plastic card with an illustration of the President and First Lady on the obverse and issuance information on the reverse. Each set is priced at $11.95 pluss application shipping and handling charges. Orders may be placed at http://usmint.gov/catalog. A similar set has been issued for each release of the Presidential Dollar coin series. Previous releases remain on sale featuring John and Julia Tyler, James and Sarah Polk, Zachary and Margaret Taylor, and Millard and Abigail Fillmore. is it possible to have from the US mint sales ? The 2007-2009 medals would need to be purchased from a coin dealer or other secondary market source, such as eBay. While digging in my backyard I uncovered a bronze Franklin Pierce medallion dated 1853. The front side shows a side view of Pierce. The backside shows an Amercian soldier and an Indian facing each other with a furled flag in the background. There is some very small printing just below the top rim which I believe is witten something I can’t make out followed by Virtue and Honor. At the very bottom is “J. Wilson.” Do you have any nformation about this medallion? This is one of the Presidential Medals issued by the United States Mint. The date refers to the year he was inaugurated as President. I do not know the quantity minted, but these are pretty common and can be found for about $5 each.